The 105-mile Big Bend Saltwater Paddling Trail embraces one of the longest and wildest publically owned coastal wetlands in the United States. 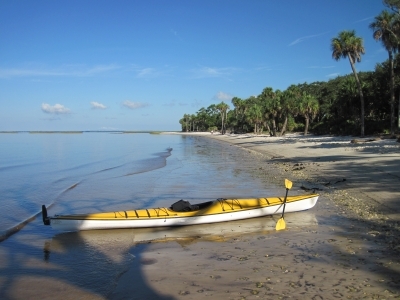 A striking array of bird and marine life along with side trips to springs, wild rivers, historical sites, wildlife havens, and small coastal towns await the seasoned kayaker paddling along this unspoiled stretch of Forida's Gulf coast. There are mutliple access points to the trail depending on which trip option is selected. Purchase a map guide to the trail and visit the website for any updates to access. 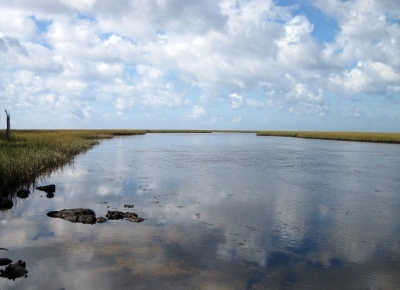 Florida's Big Bend Saltwater Paddling Trail beckons experienced sea kayakers seeking a challenging adventure in one of the longest and wildest stretches of publicly-owned coastal wetlands in the United States. A striking array of bird and marine life make their home here. Paddlers will cruise over miles of sea grass beds, catching glimpses of the diverse life dependent on this critical habitat for food, shelter, and reproduction. Expect solitude - it is possible to spend an entire day without seeing another sign of humans. There are calm, serene days where the distinction between the still water and cloudless sky blurs, enfolding one in a seamless globe. This is a wilderness immersion in a primitive, unspoiled Florida. Visitors will cherish memories of soaring birds, stunning sunsets and gentle breezes rippling marsh grasses. For the experienced paddler with primitive camping skills there are four trip options along the 105-mile paddling trail, which begins on the Aucilla River, southeast of Tallahassee, and ends at the town of Suwannee. Trip 1 covers the entire trail (9 days/8 nights), while the remaining options are for 3-day/2-night trips. All described trips move from north to south to minimize overlapping schedules and preserve the wilderness experience for multiple groups. Seven designated primitive campsites are exclusively for trail users in kayaks and are spaced 10 to 14 miles apart. Users can download the free, required permit online and choose trips based on campsite availability. Some of these camping areas are small and fragile so group size is limited to parties of eight with four tents maximum, for one night only. Canoes are not allowed and solo paddlers are discouraged for safety reasons. The campsites are closed during the scallop season and permits are only available from Sept 1 through June 30. The best time to schedule a trip is from the end of November through mid-April when hurricane season is over and there are fewer biting bugs. Most of the primitive sites will give paddlers a true flavor of the Gulf Coast wilderness; they may have a fire ring, but no bathroom facilities or potable water. No other camping is allowed on the Big Bend Wildlife Management Area. Less experienced paddlers are certainly welcome to plan day trips to explore the area's diverse rivers and creeks. The excellent “Sea Kayak Day Paddles on Florida's Hidden Coast” can also be downloaded at no cost online and offers information about enticing day trips in the area. Purchase the Big Bend Saltwater Paddling Trail guide for useful information about day trips in the Big Bend WMA. Trips include side excursions to springs, wild rivers, historic sites, wildlife refuges and small coastal towns. 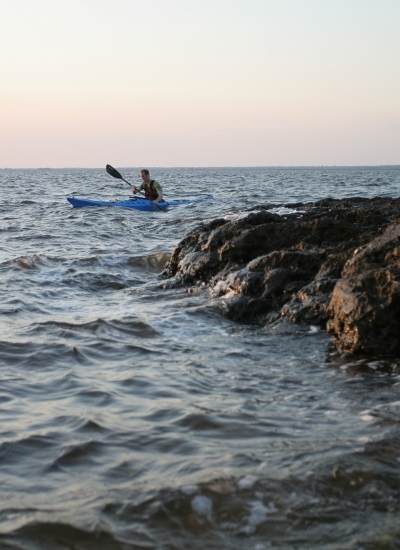 The Big Bend Saltwater Paddling Trail was designated a National Recreation Trail in 2005. 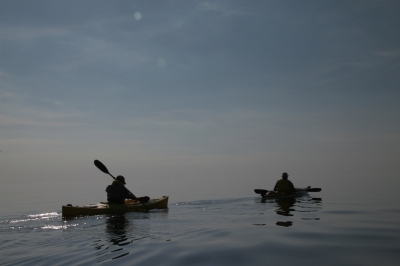 The same year, the American Canoe Association placed the paddling trail on its inaugural list of the nation's twelve ‘recommended trails,' a list of trails that are particularly good destinations for paddlers. Sink Creek. Photo by Doug Alderson. Rock Island. Photo by Doug Alderson. Kayak on Big Pine Island. Photo by Doug Alderson. Paddlers on the trail. Photo by Doug Alderson. 3. Standing on Lower Suwannee National Wildlife Refuge overlook you have the view of the Big Bend Saltwater Paddling Trail. Photo by Britney Moore.